The exacerbating global weather changes have cast significant impacts with uncertainties on the Earth’s water cycle and soil systems. Partially due to these impacts, one of the grand challenges faced by global population is securing water for food (USAID). 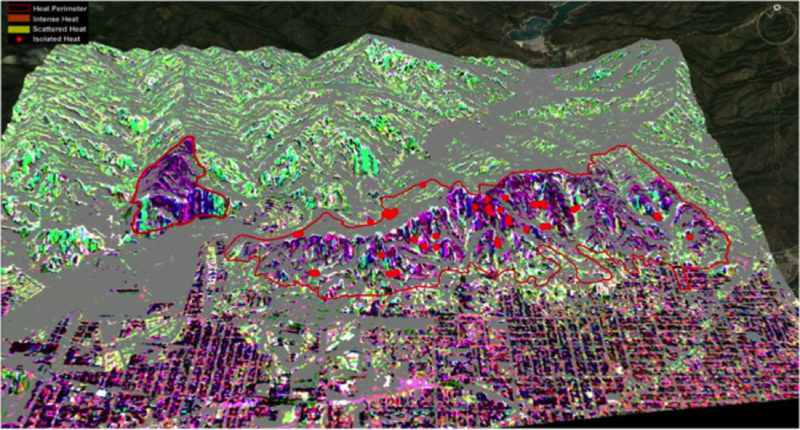 Our lab strives to explore scientific and engineering solutions based on innovative sensing and modeling technologies, including hyperspectral and SAR imaging and mechanics-based simulation, to understand water repellent, water runoff, flash flood, scour and erosion, and wildfire effects on soil-water systems. 2. Novel finite-element modeling of soil-water behavior and multi-scale modeling of hydrophobicity effects; funded by UM IDIC; a collaborative project with Dr. Xiaoming He at Missouri University of Science and Technology). 3. UAVSAR data analysis for wildfire detection and crowdsourcing data integration (collaborators: Drs. Jay Parker and Margaret Glasscoe, JPL, NASA); funded through the E-Decider by NASA. 4. Hyperspectral imaging of post-fire soil and degradation assessment (collaborating with Prof. Eyal Ben-Dor, TAU, Israel); pilot project. Map of fire damage (purple area outlined by red) produced by adapting a change detection technique to UAVSAR L-band polarimetric data. The two outlined areas are the 2013 Madre fire (left) and the 2014 Colby fire (right); wildfire hot spots indicated by red dots (courtesy US Forest Service, National Infrared Operations); fire damage indicated by purple spots.